On Sunday, Oklahoma freshman and NCAA leading scorer Trae Young had Jay Williams saying “Young is the best player in college basketball. 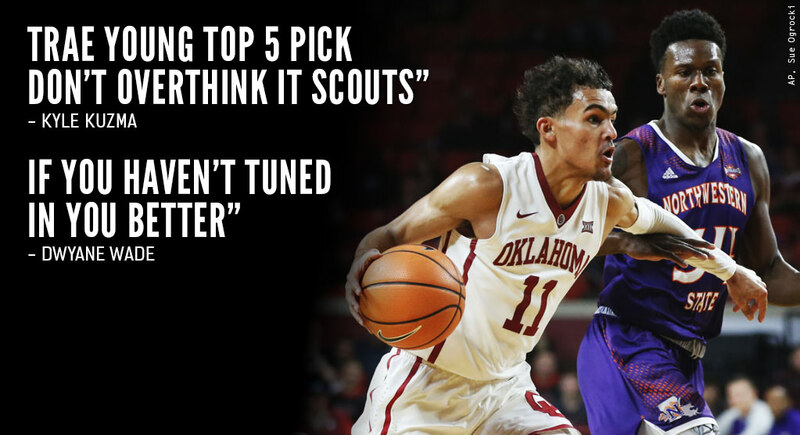 He is the Steph Curry of college” and Fox Show host Doug Gottlieb tweeting, “I’m not saying Trae Young is Jesus but has anyone seen them in the same room?” after putting up 21 points, 7 assists and 4 rebounds…in the FIRST HALF against No. 3 Wichita State. On Tuesday, Young Jesus with the shot had everyone from Dwyane Wade (“If you haven’t tuned in you better”) to Jayson Tatum (“Chill out lil bro!! !”) to Kyle Kuzma (“Young is a top 5 pick, don’t overthink it scouts) after scoring 26 points on 9-of-16 shooting and tying a near three-decade old NCAA Division 1 record for assists (22) in just 29 minutes in a 105-68 beatdown on Northwestern State. The assist record was previously set a decade before Young was born (1989) by Charleston Southern’s Tony Fairley (1987), Southern’s Avery Johnson (1988) and Syracuse’s Sherman Douglas (1989). The previous Big 12 record (18) was set by Oklahoma’s Michael Johnson (1997) and Oklahoma State’s Doug Gottlieb (1998). Take it from the people who watched, filmed and put out a lot of videos of him in high school, as great as he’s been playing in the NCAA, we have seen him do tricks in high school he hasn’t pulled out of his hat yet; just wait until he hits a game-winning three and bows to the crowd like Reggie Miller used to do.